Most of these transducers feature Automatic Probe Recognition for maximum gage performance for each transducer. 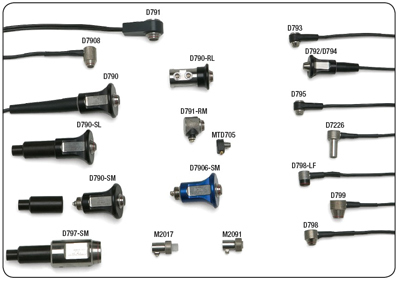 These transducers are available in an assortment of frequencies, sizes, and temperature capabilities to provide an off-the-shelf solution to most corrosion applications. Note: TP103 Certification is available at an additional charge by request.
" Adaptor required for E110 (part number 1/2XA/E110).